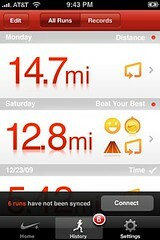 The Nike+ GPS iPhone app has added new features including: Cheer Me On, One More PowerSong, Share Run, and My Records. 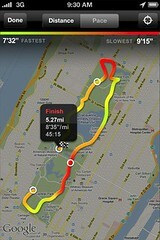 The Nike+ GPS app helps you get the most out of every run by tracking where you go and motivating you to take it further. ● Download it on the go and start running anywhere. With this app in hand, you can track every indoor and outdoor workout easily, without a sensor. ● Record your pace, distance and run route using the iPhone’s GPS and accelerometer technology so you can focus on the road ahead, and relive your run later. ● Anytime you’re up for a challenge, push farther, faster, or longer to better reach your goals. Then celebrate your victories with fun, motivational messages from Nike’s top athletes. 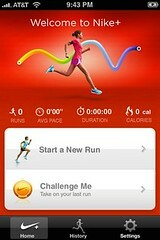 ● As you run, get voice feedback on how you’re doing or tap the map to see where you are. Then activate your personalized PowerSong for an extra boost. ● Quickly send each run to Nikeplus.com where you can brag to friends, join challenges, set goals and connect with the rest of the Nike+ community. ● Cheer Me On: Tell your Facebook friends you’re going for a run and get mid-run encouragement each time one of them likes or comments on your status. 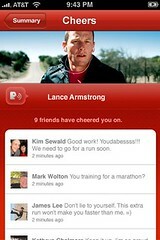 ● One More PowerSong: Blast past your goals and records by running the duration of one more song. ● Share Run: Broadcast your accomplishments to the world via Facebook and Twitter. ● My Records: View your best runs and see if you’ve got what it takes to break them. 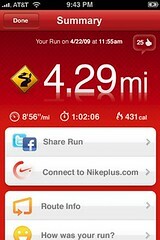 You can purchase Nike+ GPS from the App Store for $1.99.